Rod McCullom writes in a piece for Ebony that the death of Prime Minister Meles Zenawi means little for the future of the African nation. United Nations Secretary General Ban Ki-moon echoed these remarks, adding that Meles will be remembered for "exceptional leadership." 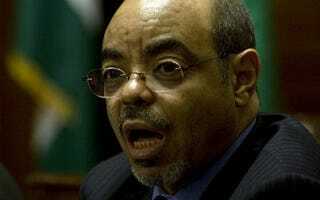 None of these statements mentioned that Meles leaves a troubled record on human rights. Meles ushered in "a sharp deterioration in civil and political rights, with mounting restrictions on freedom of expression, association, and assembly," reports Human Rights Watch. Others were far less charitable and applauded the death of the man they described as a "blood-sucking … genocidal terrorist tyrant." Meles seized power in 1991 from a military junta that had achieved global infamy for policies that contributed to the famine, starvation and death of more than a million people. As many as 500,000 people alone were killed during Mengistu Haile Mariam's violent political campaign known as the "Red Terror" of the late 1970s. This was after the despotic 44-year-rule of Emperor Haile Selassie that Mengistu overthrew in 1974. Read Rod McCullom's entire piece at Ebony.com.